Economic instability, political dissatisfaction, uncertainty over whether your vote will count – welcome to the issues of the day, circa 1647. A nobleman sits at the banqueting table of King Charles I and enquires about a servant’s sick child. We all suffer, he admonishes – settling in among the excessive food and golden candelabras, and sipping his expensive wine – but it brings us closer to God. A soldier gathers a crowd of starving peasants with rhetoric about the imminent second coming and urges them to take up arms against the antichrist Norman king to usher in the New Jerusalem. Scenes of rioting and pillaging follow. During the 1647 Putney Debates the idealism of the poor, with their desire to choose the leaders by whose laws they will have to live, are undermined by those currently in power. Freedom for the masses, the MPs argue, would lead to anarchy. Better leave the running of the country to those already in charge. In a series of these and other vignettes, playwright Caryl Churchill guides the audience through Light Shining in Buckinghamshire, a play about the tumult and confusion caused by the brutal civil war that ravaged England in the 1640s. It’s a challenging story to follow, with its attempt to portray social and political upheaval through a handful of peasants, soldiers and leaders across nearly a decade. And the religious fervour underlining every scene is in turns exhilarating and uncomfortable to watch. The cast and supporting company, many of whom are required to play more than one role, do an exceptional job with the demanding material, with stand-out performances from Joshua James, Nicholas Gleaves, Ashley McGuire, Adelle Leonce, Trystan Gravelle and Alan Williams. Es Devlin’s set, too, is magnificent – a huge table that first hosts the Norman rulers and then the MPs, symbolically removed from the action taking place centre-stage, and by the end of the play the table of politics becomes a muddy field. Bruno Poet’s lighting provides some much-needed continuity, and Helen Chadwick’s choral accompaniments, delivered by the company, add to the heady religious atmosphere. If you aren’t acquainted with this period of history beyond the Roundheads and Cavaliers, you may be left a bit confused about the details of who and what and why. The ideas, however, are easier to follow. The play’s themes of economic instability, political dissatisfaction and who should have a voice in how the country is governed feel incredibly current. Indeed, the passionate Putney Debates – the best part of the play – are like a more eloquent version of today’s election debates. Churchill’s audience is certainly put to work, earning understanding through concentrated effort, and creating the moral of the evening for themselves. But in theatre as in life, the good things are often hard won – and worth the fight. 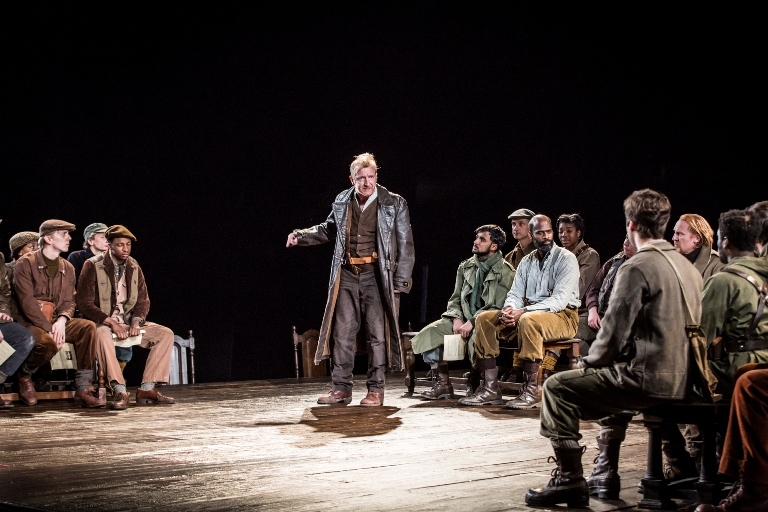 Directed by Lindsey Turner, Light Shining in Buckinghamshire is playing at the National Theatre through 22 June.